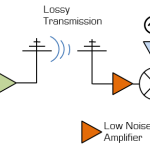 Frequency multipliers are used to generate higher harmonics from an input sinusoid. In particular, the job of the doubler is to output only the 2nd harmonic. Invariably, the fundamental tone and higher harmonics will leak to the output as well; how much lower the power of these tones are compared to the 2nd harmonic is known as their “suppression”. Doublers generally require a large input signal (greater than 12 dBm) to work properly. To reduce stress on your signal generator, you might consider feeding a smaller signal into an amplifier, and using the amplifier to drive the doubler. Unfortunately, you will observe that the suppressions of the fundamental and 3rd harmonic are much worse with the amplifier attached. What happened? 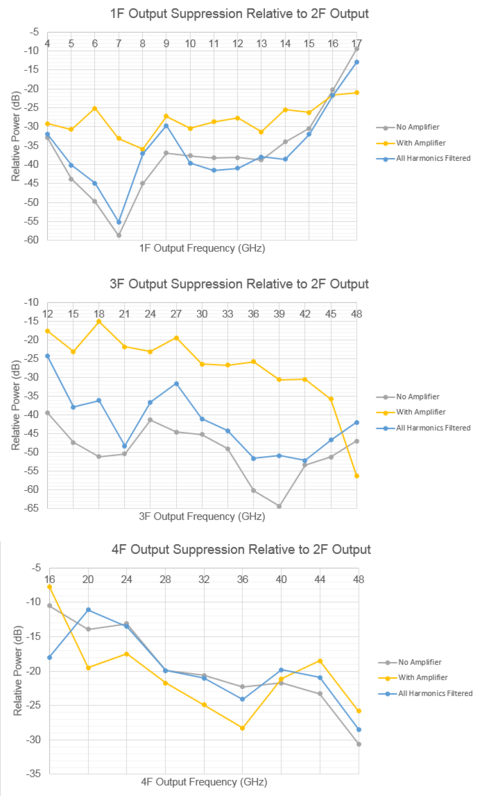 Why should the amplifier make a difference? An important thing to remember is that amplifiers are nonlinear and generate higher harmonics. In our measurement setup, we fed a 4 dBm sine wave into an amplifier; out of it came 15 dBm at the fundamental frequency, but also -10 dBm at both the 2nd and 3rd harmonics. This is a problem because the doubler is also nonlinear and mixes input frequencies. In particular, the fundamental tone mixes with the 2nd harmonic, producing output frequency products at the fundamental and 3rd harmonic. 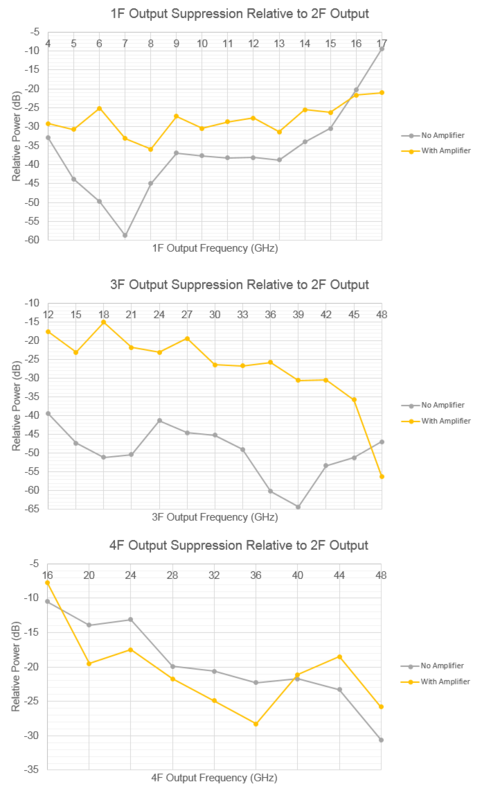 To get rid of this effect, we simply add a low-pass filter after the amplifier to take out all of its higher harmonics (see the characterizing mixers properly blog) so that only the fundamental tone reaches the doubler. Notice that the fundamental and 3rd harmonic are suppressed almost to the levels we observed when driving the doubler directly with a signal generator. At this point, you may be asking how the 3rd harmonic coming out of the amplifier mixes with the other tones. Mixing with the fundamental, we should get extra power at the 2nd and 4th harmonics; mixing with the 2nd harmonic, we should get extra power at the fundamental (and 5th harmonic). To investigate the effect of the 3rd harmonic mixing, we low-pass filter it out while keeping the 2nd harmonic behind. 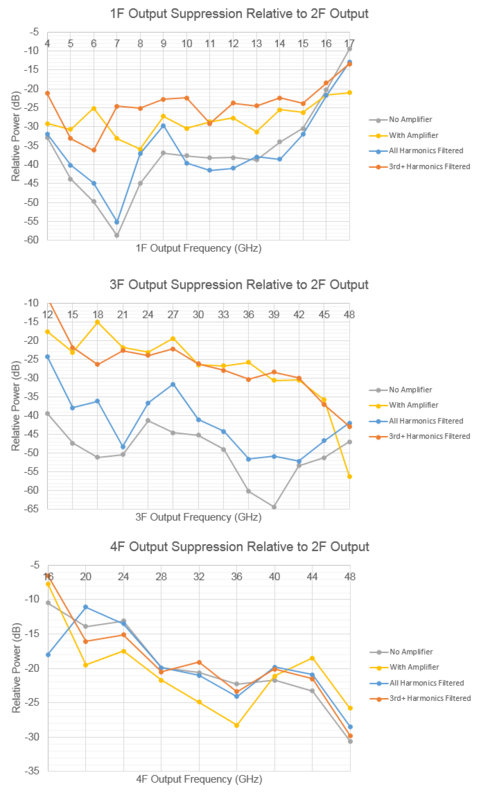 Let’s examine the case of fundamental mixing with the 3rd harmonic to get output tones at the 2nd and 4th harmonics – why doesn’t filtering out the 3rd harmonic seem to make a difference? Looking at the graphs, we can see that the doubler itself created 2nd and 4th harmonics that are already very strong. The contribution due to the 3rd harmonic mixing is negligible relative to the already-present tones. How about the case when the 2nd and 3rd harmonics mix to create a fundamental tone? It seems as if the problem got worse after we did the filtering. Why? I don’t really know. The lesson of the day is to make sure you filter out all the harmonics first.